At Norman Hege Jewelers, we don’t just work with diamonds and other fine jewelry. We work with people. Serving our community is what has kept our doors open for over 60 years. Our connection to the York County area is what truly sets us apart from other jewelry stores near you in Rock Hill, SC. Ever since our first day in business, we’ve been a locally owned and family operated jewelry store. From the beginning, we’ve dedicated our time to providing top-notch personable service from highly skilled jewelers. From the simplest to the fanciest fine jewelry, we sell, design, and repair it all. Our goal has always been to be the first place people think of when they need fine jewelry and gifts. We’re proud to support the communities of Rock Hill and surrounding areas. We believe in helping businesses succeed in our city, so we’re proud to be a member of the York County Regional Chamber of Commerce. We also help with various community events throughout the year. One example is our participation in local high school homecoming ceremonies. We are honored to present the homecoming crown at South Pointe, Northwestern, Rock Hill, and York high schools. We’ve been honored to receive many Buzzie Awards over the years. This is the Rock Hill Herald’s people’s choice award. There’s nothing that means more to us than being recognized by our customers for our customer service and our outstanding selection of fine jewelry. 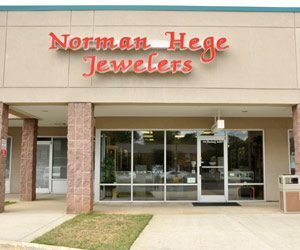 As you’re looking for jewelry stores near you, we invite you to stop by Norman Hege Jewelers to see how our legacy continues. Whether you’re shopping for diamonds, getting a piece of jewelry repaired, or just browsing for the perfect gift, we’re here to make the experience perfect. We hope to see you soon – and for many more years to come!